At Trak.in we recently covered a Survey which clearly pointed out that Indian employees and Indian companies scored better on the work-life balance ratio in 2012 than in 2010. The implementation of the concept of work-life balance essentially stems from Western management theories. While the same may not have been entirely present in traditional Indian businesses and corporate, increased focus on work-life balance in India is being seen. Companies like Infosys, Wipro, Yahoo India, Google India Dell India, Microsoft India, Accenture and HCL Technologies amongst many others have already begun taking steps in this direction. 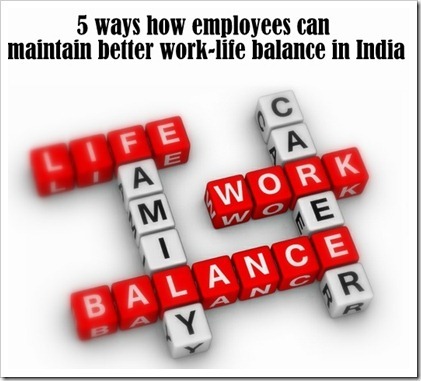 Here are 5 ways in which employees can take steps to maintain a good work-life balance at their workplaces. Not all companies in India offer generous work-life balance options yet, but quite a few surprisingly do. For instance, nearly 50,000 employees at IBM India and about 15,000 tech workers at HP India are taking advantage of their companies’ work-life balance option. They virtually have no cubicle in their offices and are allowed to work from home. Microsoft India too reimburses telephone and broadband usage to their employees for working from home and offers them a variety of flexible working options. Joji Gill, HR Director of Microsoft India told TOI "Not only does this lead to a better work-life balance for existing employees, and a cause for retention, it is also an attractive aspect for potential employees." Cisco India has gone to the extent of realizing the potential of true connectivity and is creating home offices for its employees. They offer data cards, intranet smartphones, laptops and other specialized Cisco Virtual Office equipment to employees so that maximum productivity can be achieved. Employees should talk to the HR team of their companies and see if working from home can be made a reality within the framework of their work profiles. Unlike western countries a majority of the Indian workforce still functions on a 6 day week routine. However with certain MNCs taking the lead with 5 day work weeks, big corporate houses may very well be seen giving weekend offs to some of their employees. Employees in a non-customer/client facing environment may be able to plan their work week in a way that a few days stretched out during the week could result into a two day weekend. Considering that HR teams are looking to be more flexible and accommodating, employees could approach their managers and request the same. For the uninitiated, a split shift is one of the latest work-life initiatives that India Inc has taken to. In split shifts, employees can work for a few hours in the morning, attend to their personal work during afternoons when business tend to be typically slack and return in the evening to close the day. ET reported that recently IT giant Mphasis implemented the Split Shift initiative. Companies like Aegis, BPO Outsourcing Solutions Company and Apollo Hospitals in Bangalore have also followed suit. This strategy allows them to induct more women into the workforce and retain talent who would otherwise leave due to inflexible work hours. Of course split shifts are offered to employees only with a certain profile and in situations where the employee does not live too far from the workplace. But for those who fit in this slot should give it a go if this makes work a little less stressful. Surprisingly many employees who work in corporate houses with sprawling campuses and innumerable facilities don’t actually use it. Many big companies in India offer gym facilities, sport courts, crèches, grocery stores, banking facilities and cafes within their campus. Employees should try to use these facilities within work hours for a quick rejuvenation. Work-life balance does not always mean that employees have to divide their time equally into work life and family life. A work-life balance actually means to divide one’s time for work and for one’s own life. From this perspective, life includes family, self reflection, recreation, spirituality and social interaction. "Work expands so as to fill the time available for its completion" says Parkinson’s law. Taking a hint, employees should look at maximizing all available resources, including time, to get work done. Pending personal calls, chatting with colleagues, personal errands and everything else that is not related to work can be finished once work is complete. A great way to optimize time is to work on a schedule and follow a timetable. While micromanaging small tasks may sound menial, the precious time saved could very well be the extra time an employee gets to spend away from the office. The Indian workplace is slowly moving away from the notion that longer hours spent in the office are directly related to higher productivity levels. "Spending more time in office doesn’t necessarily translate into productivity" mentions Samar Sheikhawat, Senior VP Marketing at UB Group, to ET. For employees looking forward to a better work-life balance, this is a clear hint at gunning for an early exit from the office by boosting productivity levels during the day. So, how do you rate your own work life balance? Pune Startup develops Saga, An Android based IPTV device! Prolific HR Consultants (India) Limited Bangalore“, is a public limited company with revenues a little over Rs. 190 million a year and engaged in the HR business for the last five years. We are a focused player in the HR Outsourcing space and offer a range of People Solutions. It’s not so easy to maintain a good work life balance but not impossible also. The steps mentioned over here will definitely help employees to maintain their work life balance.